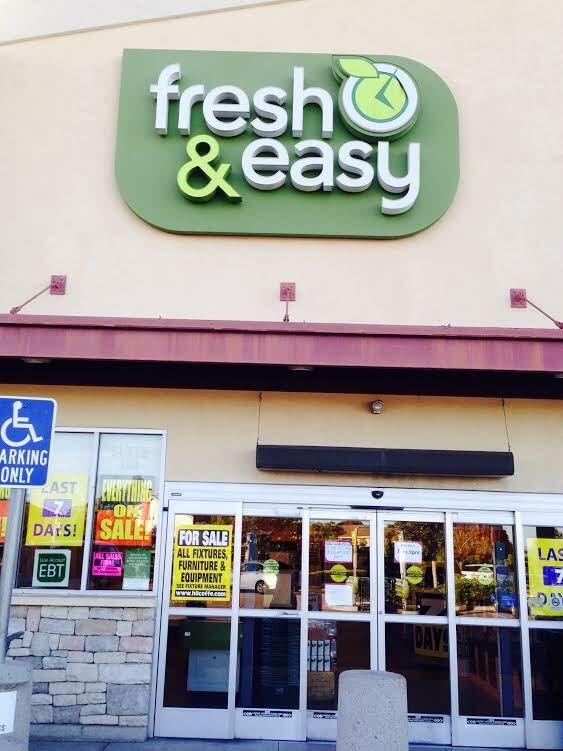 Fresh & Easy will be closing its doors. 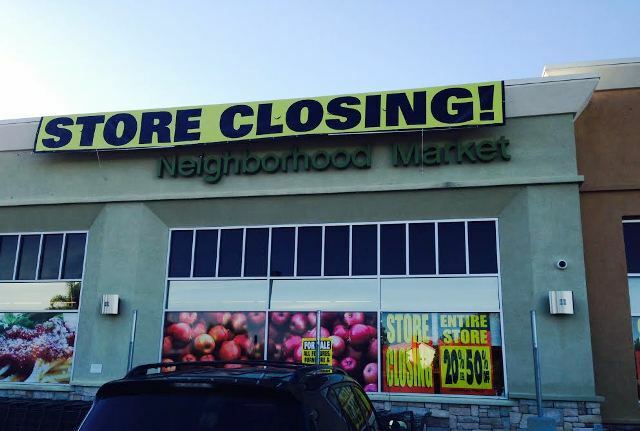 This makes the second loss of a grocery store in the Ocean Beach-Point Loma community in the past three years. We had previously mourned the loss of Appletree Market. Now we are losing Fresh & Easy. Technically Fresh & Easy, at the corner of Catalina and Talbot St., lies within the boundaries of the Peninsula Planning Board. But many a OBcean has headed up and over the hill to the store. The self-checkout was favored by some as quick and convenient. The prepackaged meals were likewise seemingly well-liked by many. But the self-checkout and signature Fresh & Easy products were not enough to keep the company from declaring bankruptcy for the second time, and not enough to keep the doors open. On October 30, 2015, Fresh & Easy LLC filed a petition for relief under Chapter 11 of the Bankruptcy Code 11 U.S.C. §§ 101-1532 (Case No. 15-12220). On or around November 13, 2015, the Friends of Fresh & Easy Rewards program will be terminated with the closure of the stores. The microsite and mobile site will be disabled and points will no longer be converted. Any rewards loaded to a “Friend’s card” will not be redeemable. Points were previously obtained through purchases. And specials and discounts were previously offered through the Friends of Fresh & Easy Rewards program. As noted, this is the SECOND time Fresh & Easy has filed for bankruptcy. Tiffany Hsu reported on September 30, 2013 in The Los Angeles Times that Fresh & Easy Neighborhood Market Inc. filed for bankruptcy weeks after being promised to Los Angeles billionaire Ron Burkle. Fresh & Easy – prior to the first bankruptcy – belonged to the British supermarket giant Tesco. In 2013 the grocery store traded hands from Tesco to Burkle’s Yucaipa Cos. At that time in 2013 the Fresh & Easy debt was cited to be between $500 million and $1 billion. The transition to new ownership in 2013 occurred while business continued as usual. This time however the doors are closing. According to Hsu in The Los Angeles Times, the brand ran into troubles from its inception, opening in the crowded and ultra-competitive West Coast grocery market on the eve of the recession and relying heavily on technology in an industry driven by human contact. In Fall 2013, analysts believed Burkle’s game plan was to use Fresh & Easy space to relaunch the grocery chain Wild Oats Markets Inc. Evidently it appears things did not go as planned. The declaration of bankruptcy and closure of all stores seems somewhat shocking since the store on Catalina always appeared to be bustling. Between the Department of Defense and Navy employees and the students of Point Loma Nazarene University — Fresh & Easy in Point Loma seemed to be thriving. But other store locations must not have been as bustling and other stores must not have been as thriving. 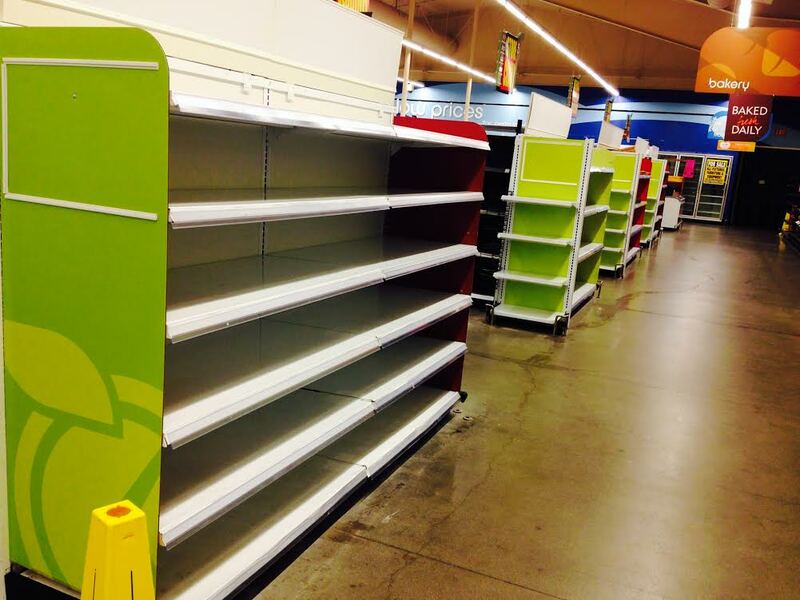 The shelves are now nearly empty as products are not being restocked. Everything is marked down 20-50 percent. 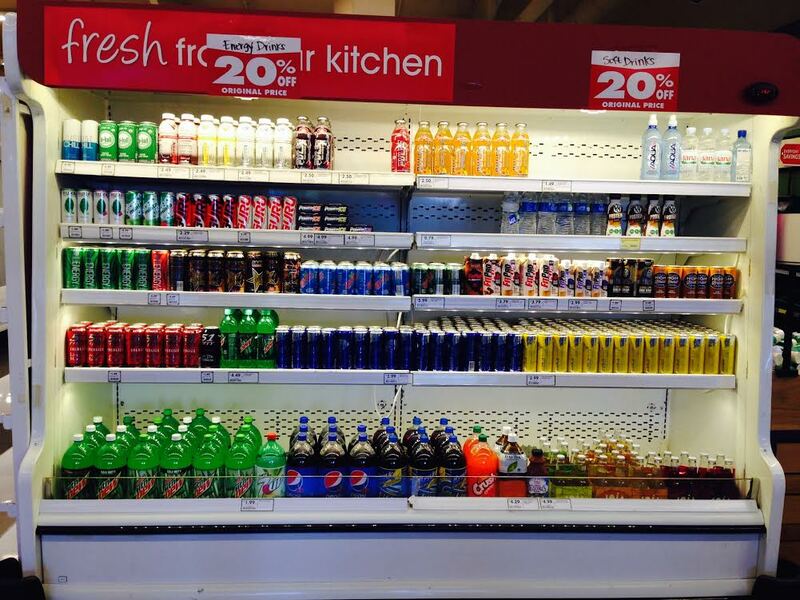 The Fresh & Easy website says, “Everything must go.” Even the store fixtures and equipment are for sale. The website also says this upcoming week is the final week and all stores will be closing. OBceans will now be driving, walking, jogging, biking, skateboarding, roller blading, bus riding, and taxi or Uber-riding a further distance than before to get to the nearest grocery store. People’s Coop is still in its historic location. CVS seems to have beefed up its grocery options as requested by local Ocean Beach leaders in the early days of approving the plans for the CVS at Cable and Santa Monica. Stump’s Family Marketplace on Voltaire St. and Baron’s Market on West Pt. Loma Blvd. remain excellent options. And further down the road are Ralphs, Vons, Trader Joes, and Sprouts. There is also Grocery Outlet on West Point Loma Blvd. But the problem remains of no fully stocked grocery store near the main drag of Sunset Cliffs and Newport Ave.
Gee, I thought all these corporations and private companies were making obscene profits. How could they be going bankrupt? Not all of them are making “extreme” profits. Trump says bankruptcy is merely a legal business tactic. F & E was horrible over the past 2 years. I haven’t even shopped there since, when I live just 2 blocks away. They said because all their employees were stockers and only had 1-2 people work the registers that prices would be cheap. Well, they were. For about a year. Then prices started going up and up. So much that they were no longer cheap, but more expensive that other places such as Stumps and Ralphs. For example. Their sandwiches use to cost $1.99 when they opened. A year later they were $2.99. Then a few months later they were $5.99. And Subway is right next door advertising their 5 dollar foot longs! You mean the 11″ foot long? Thanks PL Local! Those price changes did occur… And didn’t help business. The 50% markdown bargain bin was eliminated — and that was a sad loss too. Subway’s foot longs definitely were ongoing competitors. Also a quick correction… F & E is on Catalina and Talbot. Not Voltaire. You had it write in the second paragraph. And thanks again PL Local! I shopped at Fresh and Easy since they first opened and will miss them. A couple weeks before they announced they were going out of business, I noticed a lot of the usual stuff I was buying wasn’t getting restocked, so I knew something fishy was going on. I’ve since started going to the Ralph’s at Nimitz/Rosecrans and noticed some of the stuff I was buying at F&E were actually cheaper than Ralph’s (even with the Ralph’s card), so the whole overpriced thing isn’t a storewide issue, it depends on the products. I wonder what will open up in it’s place, hopefully another grocery store. Hsu, Tiffany. “Tesco’s Fresh & Easy declares bankruptcy to ease sale to Burkle.” Los Angeles Times. Sept. 30, 2013. Hals, Tom and Jim Christie. “Investor Burkle’s Fresh & Easy grocery chain files for bankruptcy.” Reuters. Oct. 30, 2015. Perhaps not everyone is as fascinated in the details of the grocery store as I became — but I do know a number of locals shopped there or worked there and now we are down another grocery store!! In the final hours, Fresh & Easy employees were telling customers: “Fill a cart and pay only $20.” People were throwing what few items were left in the store into their carts. At 3:45 pm there were lots of pickles and tomato soup cans left (and these were disappearing quickly as the last rush of customers visited the store and started to fill their carts). A number of the appliances and fixtures had SOLD tags on them– and a good number of those appliances and fixtures said there were being held for “Liva.” Which could be Liva Distributors located in San Ysidro and Spring Valley. 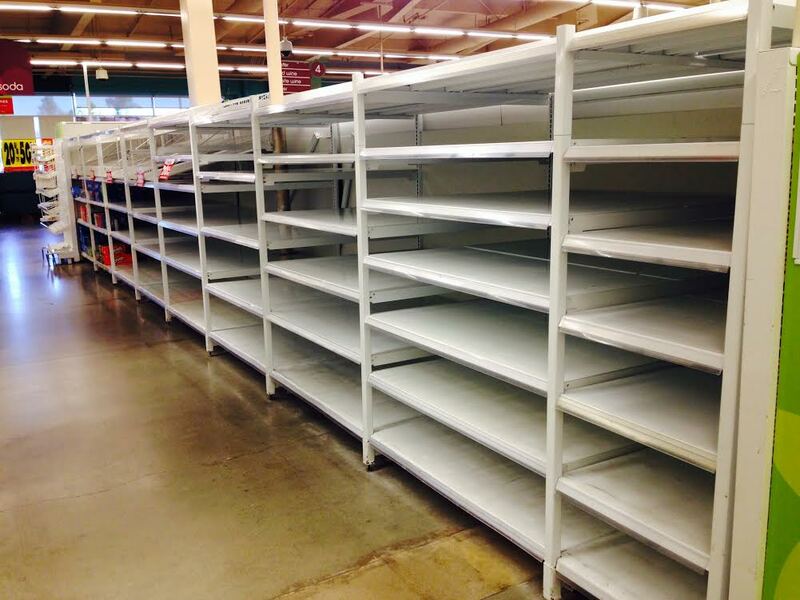 Several thousand dollars worth of fixtures, shelves, trash cans, flower and plant stands, bakery carts, and freezers in the Point Loma store were marked as SOLD and reserved for Liva. Every item for sale in the store, large and small, had a price tag on it — including freezers, shelves, and trash cans. The acquisition of appliances and equipment would likely be a nice gain for Liva and a small dent in the Fresh & Easy debt.